So it has begun – with the Ericsson equation being taken out of the Sony Ericsson partnership, just how do the two new smartphones announced at Mobile World Congress in Barcelona, Spain, last night fare? 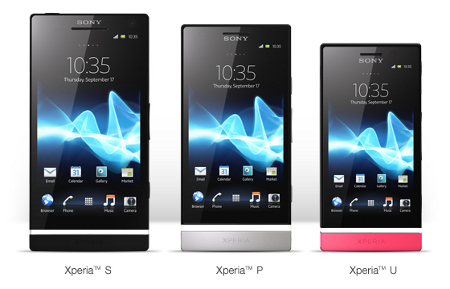 Well, we are looking at the XPERIA P and XPERIA U, with the XPERIA S being ready to ship to worldwide markets as well. The XPERIA NXT series is supposed to deliver a connected entertainment experience to the masses, so let us see just how they are going to achieve that. Bringing together the best of Sony technology as well as premium entertainment, the Xperia NXT series will be part of Sony’s connected experience to let one enjoy and share content on whichever screen that best suits them, never mind if it is a smartphone, TV, notebook or tablet. Sony takes pride in their design, where the Xperia NXT series sports a look which can be recognized instantly. These smartphones will feature intriguing design features that include the “transparent element”, which is basically a band that will encircle the base of the handset as well as integrate invisible antenna components. This particular transparent element will illuminate whenever one receives incoming calls, text messages and perhaps social network notifications. Not only that, there is a spanking new User Interface (UI) that will follow a similar design principle, where it will enhance the Android experience that allows one to enjoy rich applications as well as content with a simple and clean look. Both the XPERIA P and XPERIA U will come with a Reality Display that is powered by Mobile BRAVIA Engine, and it takes slightly more than a second to bring the camera to life, while its 1GHz dual-core processors get the job done regardless of the situation. Both models will arrive in their respective markets in due time – we will just need to be patient and start counting the pennies in our bank account if we want one.